Are you partial to hostas? So are we! We're the Georgia Hosta Society. Welcome! The Georgia Hosta Society brings together hosta enthusiasts ranging from beginners to veterans; patio gardeners to those with an acre or more of wooded landscape; amateur hybridizers to professional growers. We hope you'll consider joining us in the rewarding and delightful work of selecting and nurturing these fascinating and beautiful plants in our local environment. The Georgia Hosta Society’s 30th Annual Hosta Show is scheduled for Saturday, May 11, 2019. The location will be the Fellowship Hall of the First Baptist Church of Tucker, 2367 Main Street, Tucker, Georgia. We plan to accept entries on the Friday afternoon before the show. And we're planning a wonderful plant sale in conjunction with the show. You'll have the opportunity acquire hosta plants from premier vendors. 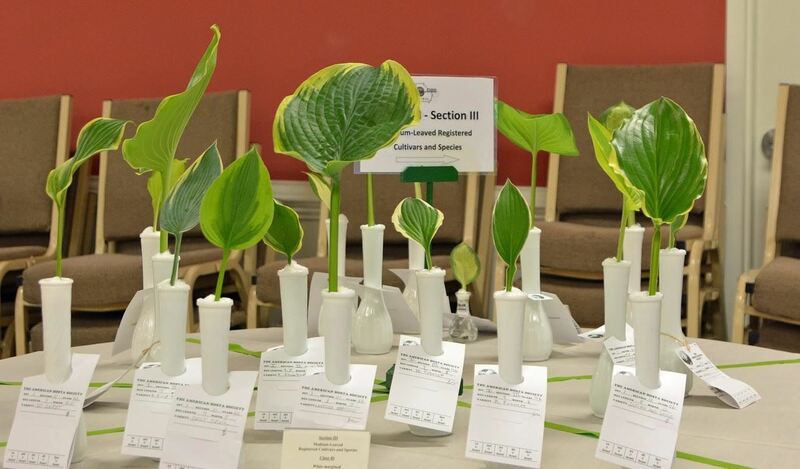 Tips on selecting and preparing entries for the show are discussed in the most recent issue of The Hosta Journal (Volume 49, Number 1) by prodigious ribbon winner Randy Goodwin of Zionsville , Indiana. The article, entitled “Advice to Achieve Blue or Best of Show,” appears on page 65. Check it out. Note to GHS Members: A full color photo essay on the 2018 show will be in the September issue of Georgia Hosta Notes. Check out these member benefits! We're fully committed to devoting the resources necessary to expand our members' knowledge, and that includes bringing in leading experts on hostas, on companion plants, and on the inclusion of hostas in different garden environments. Four times a year, GHS members receive Georgia Hosta Notes, expertly edited by Harold McDonell and distributed by Scott Smith and Mark Malaguerra. Opening garden gates for our members enriches and enhances the hosta-growing experience as much as anything else the Society does. Exploring a garden with like-minded folks can be inspiring, can reveal solutions to problems, and can help avoid gardening pitfalls. Click here to join and start your Georgia Hosta Society adventure with us!